Thief River Falls has a rugged and talented bunch, paced by senior Micah Ranum (Photo by Tim Kolehmainen). In late February, the event calendar for Warroad lists only a few activities -- all of them on ice -- and most involving the Warriors. Hockeytown USA didn't get its name lightly. One of the dynasties of high school hockey, Warroad usually closes down this time of the season to follow its team to the state tournament, something the Warriors have done 12 times in the last 17 years out of Section 8A. Warroad (17-8-0) is favored again this winter and received the No. 1 seed among northwestern Class A schools. As opponents have learned over the years, it's not wise to pick against the Warriors. This year's squad has a different look, however. The Warriors remain as stingy in their own defensive zone as ever (just 2.08 goals per game), but scoring has been an issue at times for Albert Hasbargen's bunch. Warroad is averaging 3.24 goals per game with a power play that has stumbled at 14.1 percent. Steady All-State defenseman Carson Gray (6-22-28) is tied for the team scoring lead with forward Nicholas Stoskopf (13-15-28), just ahead of David Nelson (17-10-27) and Austin Streiff (10-10-20). Stoskopf and Nelson played on an all-senior first line with Redwood Valley transfer Eric Miller much of the season. They'll get their scoring chances, but the Warriors need scoring depth from other lines, something Streiff has provided at times. He's netted some big goals, including both game-winners against rival Roseau. One place Warroad will not have to worry is in nets, where junior Andy Foster (16-8-0, 2.01, .911) continues to shine after rising to the varsity level mid-way through his sophomore campaign. Foster has proven to be a big-game goaltender in his short career and can carry the Warriors at times they struggle to score. Cory Mack and East Grand Forks hope to pull a few upsets in the section playoffs. Along with Zack Lawdermilt and Tommy Hajicek, Mack anchors the Green Wave's top line (Photo by Tim Kolehmainen). Make not mistake, though. The Warriors aren't invincible. Several other contenders believe they have the horses to knock off Warroad, such as No. 2 Thief River Falls (16-8-1), the only other team to represent Section 8A in the past eight years. The Prowlers split two games with Warroad this winter, losing 5-2 on Dec. 21 but winning the rematch on Jan. 20, 2-1 in overtime. Warroad and Thief River Falls have some great playoff history over the past few years and should they meet in the final, expect another barn-burner. The Prowlers also have home ice advantage throughout the Section 8A playoffs, as the "Little Ralph" will host all games from the quarterfinals through the final on Thursday, Mar. 3. Rugged Micah Ranum (20-20-40) is the only Prowler with more than nine goals, although seven of his teammates have scored between seven and nine goals. Ryan Crosson (9-25-34) and Brady Meunier (7-14-21) lead Thief River Falls with three power play goals each and are second and third in overall scoring. 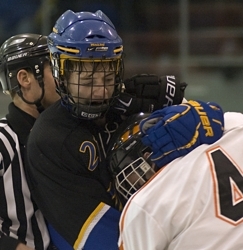 Thief River Falls has remained strong defensively, even after graduating longtime All-State goaltender Zane Gothberg. Josh Koop (9-4-0, 2.25, .895) and Jon Narverud (4-4-1, 2.70, .893) have split duties in nets. 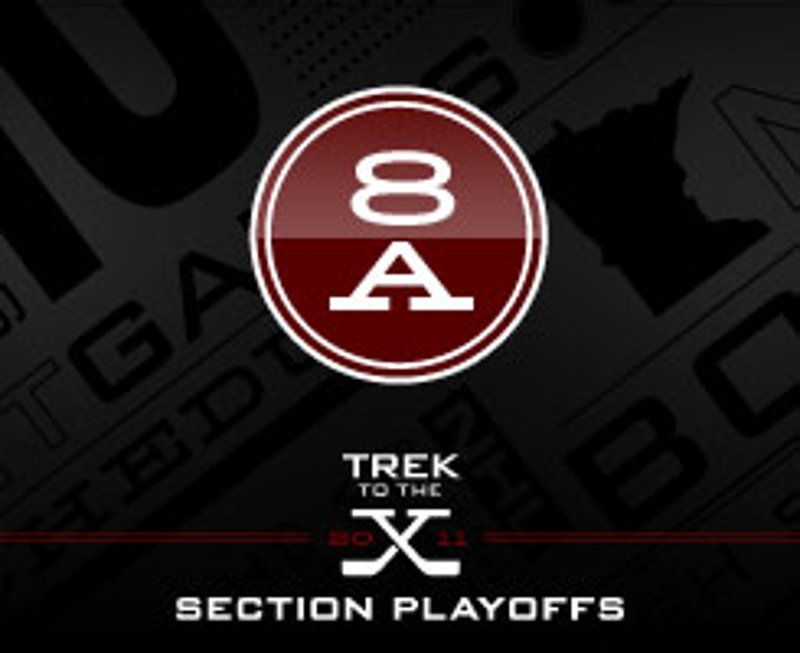 Section 8A might be a low-scoring affair all the way around. No. 3 Lake of the Woods (16-6-3) relies heavily on arguably the best goaltender in the state, senior Alex Lyon (16-6-3, 1.48, .948). But the Bears were shut out twice by Warroad this winter. No. 4 Crookston (11-11-3) and No. 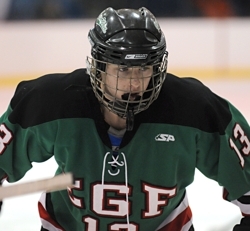 5 East Grand Forks (9-14-1) should offer a great battle of strengths. The Pirates are a strong defensive team with All-State defenseman Mark Bittner (4-24-28) leading the way, while the Green Wave have a shifty and talented first line of Cory Mack (11-17-28), Zack Lawdermilt (10-16-26) and Tommy Hajicek (15-11-26). No. 6 Red Lake Falls (13-10-1) and No. 7 Park Rapids Area (12-12-1) have some great individual players, but perhaps not the depth to compete with the first five seeds. Still, it will be fun to watch players such as Garrett Schmitz (30-19-49) and Dylan Zutz (21-27-48) of Red Lake Falls and Sam Coborn (35-29-64) of Park Rapids give it their all. Four straight Section 8A titles and seven in eight years. Who can argue with that success? Warroad just continues to churn out top players every year and this year's club again is strong in front of junior goaltender Andy Foster. The Warriors haven't been scoring goals at their usual pace, but tough defense and Foster have been enough to earn the No. 1 seed. Austin Streiff has tallied some big goals for Warroad. Everybody's darkhorse contender at the season's start remains just that as it ends -- a darkhorse. The Green Wave have some terrific young talent and a quick and savvy first line of Zack Lawdermilt, Cory Mack and Tommy Hajicek. It just hasn't translated into as many victories as expected. Nonethless, the fifth-seed is a dangerous matchup for No. 4 Crookston. In two games, Crookston earned a tie and a one-goal win.